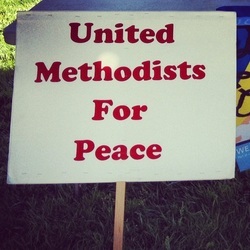 Back in 2001, members of St. Paul's United Methodist Church joined others for an interfaith witness for peace. Every Friday since then, the vigil has continued. You can join them any week from 5:00-6:00 PM outside the MLK Jr. Library on 4th and San Fernando. Along with joining in the vigil, you can learn a great many things from those who have been peace activists for many years. We use our marquee on the church lawn to begin thought provoking discussions. Each month a quotation along with an essay by David Lowe (member of St. Paul's) is provided. 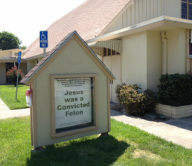 St. Paul's UMC has been blessed with property in downtown San Jose. In our community we see hunger and homelessness as real life concerns every day. In order to serve our neighbors, we have a small food pantry that allows us to provide easily accessible foods (ie: no kitchen required) for our neighbors. In addition, we lease out a property at less than market value for use as an independent living facility for Lifemoves clients who would otherwise lack housing. Our congregation is building ongoing relationships with the residents through monthly potluck meals and some residents join us for worship as well. St. Paul's will be hosting Village House, a rotating shelter for 15 women later in the year. St. Paul's is a Reconciling Congregation, part of the Reconciling Movement in the United Methodist Church. RMN mobilizes United Methodists of all sexual orientations and gender identities to transform our church and world into the full expression of Christ’s inclusive love. Since 1984, Reconciling Ministries Network has offered Gospel hospitality and affirmed our baptismal promises which include lesbian, gay, bisexual and transgender (LGBT) persons as fully part of our church family. This hospitality and celebration of each person is an important value at St. Paul's. We joined other congregation in adopting the Declaration of Inclusion.